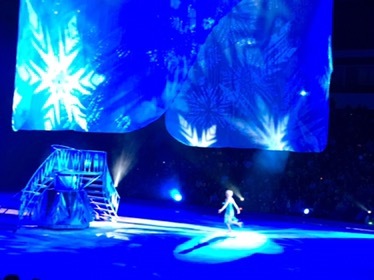 So, we gifted miss R with a surprise outing to see Disney on Ice: Passport to Adventure. Her behavior has, delightfully, been on the upswing since the 4-nager sh*t storm she produced a couple weeks ago. Since we like to be fun parents and are getting super pumped for our winter Disney World extravaganza, we purchased tickets a while back. Everything went pretty well! Baby K didn’t melt down once — in fact she had her eyes peeled, facing forward in her awesome Yokohama carrier — most of the 2-hour show. Since K didn’t have a seat, this was what we were hoping for. We didn’t spoil the surprise even a little bit in the days that preceded the show, so when Raya saw princess garb being sold outside the venue — which, by the way, was a steal compared to the $35 wands and $12 popcorn and snow cones that awaited us inside — she got pretty excited. 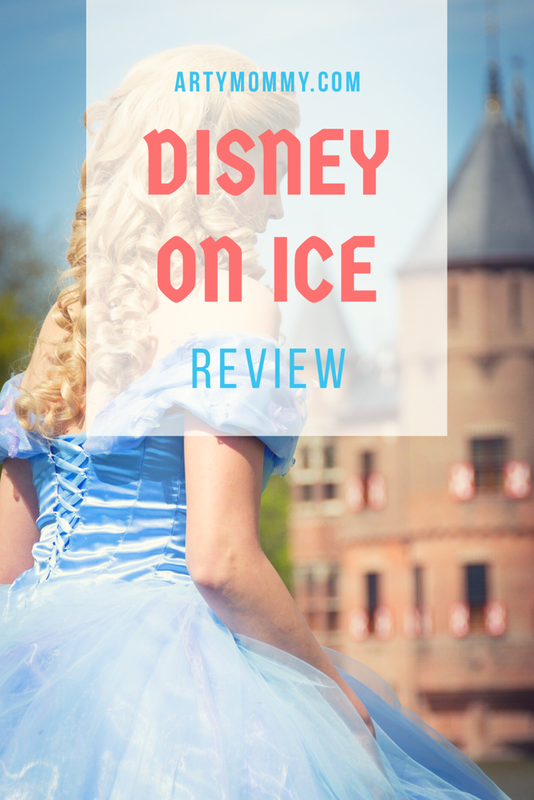 It wasn’t until she walked up the stairs and saw that the arena had been transformed into an ice rink that she said, “Disney on Ice? 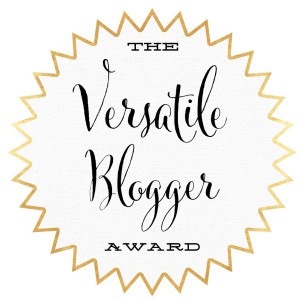 !” The throngs of costumed kids and the vendors selling sparkly (while outrageously exorbitant) merchandise lent a magical feel to the experience. We happily purchased a giant and somewhat stale cotton candy for $12 because it offered a free plastic Micky hat. The show began with an ensemble performance of It’s a Small World, which included Mickey and his clubhouse crew. Mickey and Minnie’s presence riled up the crowd for the Lion King montage that followed. Some costumes, especially those on human characters, were superb, but others seemed pretty simplistic if you’re familiar with the designs of Julie Taymor and the like. The Lion King featured all of the original movie’s best songs which, having lived through and loved the Disney of the 90s I thoroughly enjoyed. 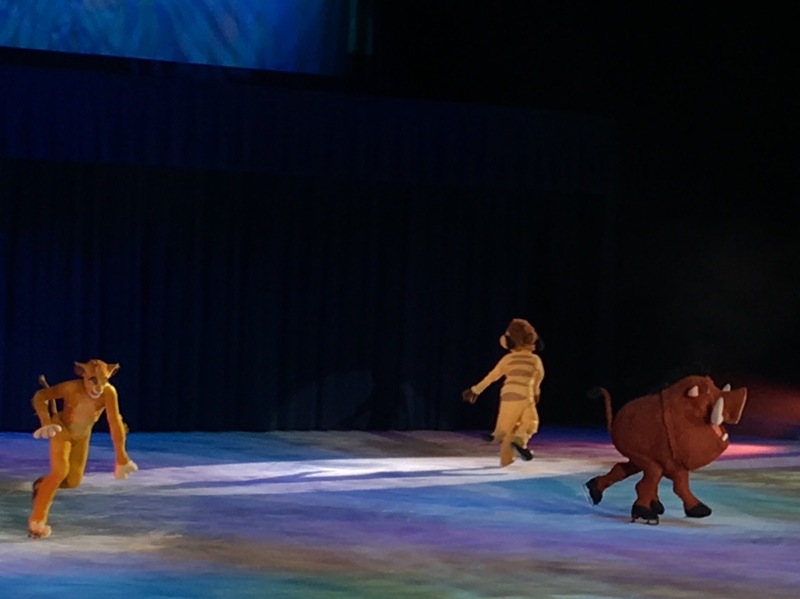 Raya kept asking when the Disney Junior characters like Kion would appear (they didn’t). Next up was Peter Pan. 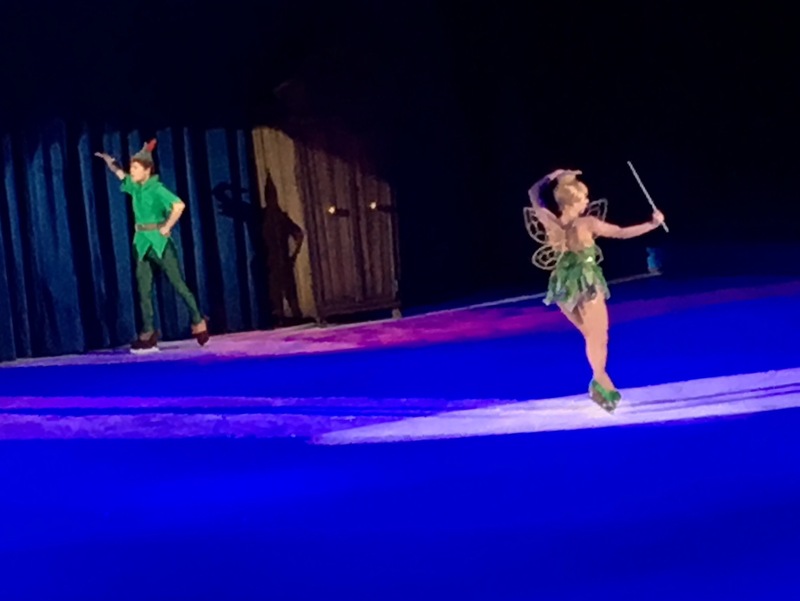 Wendy and Peter were standout skaters (and the skater playing Wendy truly was Darling) and the spunky Tink brought out a lot of giggles and “ahs” from the kiddos, but in our opinion, this vignette dragged on far too long. We’d had enough of the lost boys and Hook and were more than ready to see some familiar princess faces. After a 15-minute intermission (in which we did NOT take advantage of the $20 photo op to pose with a cardboard cutout of Ariel), The Little Mermaid commenced. 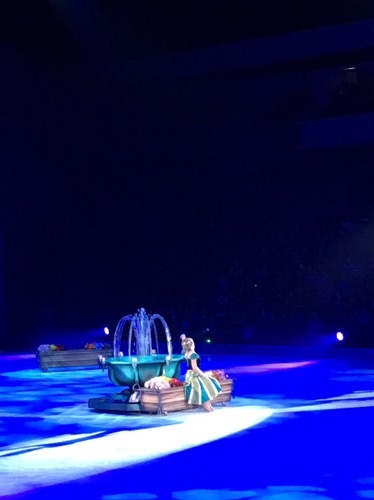 And boy, I was excited to sing along with “Part of your World” (really, who doesn’t have that one memorized?). 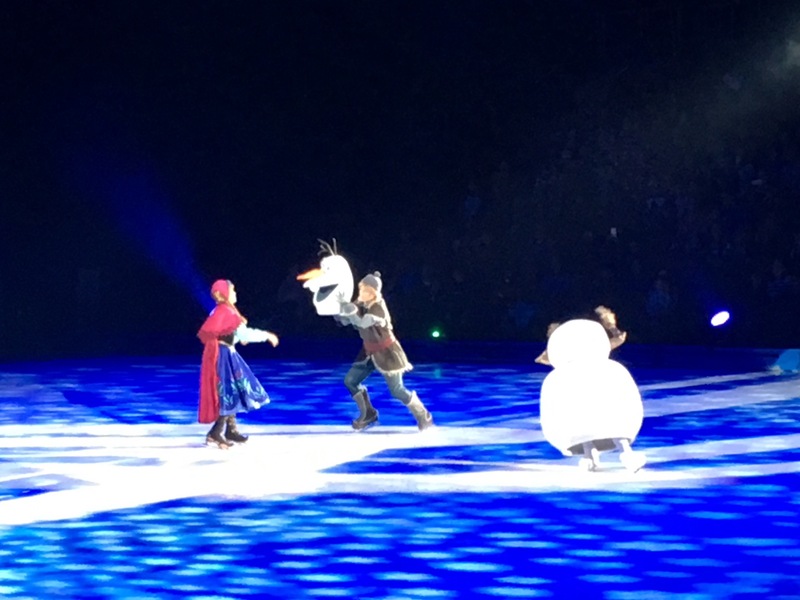 Throughout the entire show, all of the dialogue and every song was from its original movie, and I must say, the skaters were on point with their lip-syncing, which was totally believable. Frozen was saved for the grand finale, obviously. We weren’t overly impressed with the Anna character, because who can really fill Kristen Bell’s tiny but mighty shoes? But still, listening to (okay, belting out) “For the First Time in Forever” and “Let it Go” while watching Elsa et al. toe jump and axel their way around the rink gave us all the warm fuzzies. So, yes! I wholeheartedly recommend that you catch this show in your city. The actual ticket prices are reasonable, though the fees aren’t so sleuth around a bit and you should be able to score at least $5 discounts per ticket. One piece of advice though: bring your sweatshirt! It’s pretty embarrassing that we didn’t even consider this, but ice is cooooold! Let me know how you like the show and if it awakens the Peter Pan inside of you.